London Welsh head coach Justin Burnell says he has 'nothing to prove' to Cardiff Blues after leading London Welsh to the Aviva Premiership. Burnell parted company with the Welsh region in 2012 despite helping to guide them to the Heineken Cup quarter-finals as joint head coach. He joined London Welsh for the 2013-14 season and won promotion in June. As the 47-year-old brought London Welsh to Pontypridd where his side comfortably beat the Welsh Premiership champions 40-12, the former Pontypridd flanker also said he wanted young Welsh coaches who did not have a glittering playing career behind them to be given opportunities to prove themselves. Burnell, who also played for Bridgend, Newbridge and Treorchy, is one of just four Welsh head coaches in the Pro12 and Aviva Premiership. "We fall into a trap in Wales that if you're a former international player you should be a fantastic coach," he said. "There are too many good young aspiring coaches who are not former international players and I think sometimes they get overlooked. "I think that's the biggest problem." While at the Blues in 2011-12, Burnell came under pressure as 12 players decided to leave the Arms Park on the way to a seventh-place finish in the Pro12. "I was asked to do a job, to qualify for Europe and I fulfilled that. "It's quite interesting when you look back and you think what people were quite quick to say to you. "Some of the people who preceded me had a lot more money and a lot better players." The Exiles beat Bristol 48-28 on aggregate in the English Championship final in June and the visit to Sardis Road came as the teams prepare for the season ahead. "It's always nice coming back home. I have fond memories here," said Burnell. "I joined from Cardiff and my first game was against Cardiff and I scored three tries. "It was always a lifetime ambition [to play for Pontypridd]." In 2006, London Welsh sought to join the Celtic League as a fifth Welsh region. But Burnell is glad that move did not transpire given the current row between the WRU and Welsh regions. "There are a lot of politics, but why would you not want to be part of the strongest club competition in the world? It's getting better too," he said. "I don't really listen to Welsh rugby, or read much about it…it doesn't interest me. "I'm in England now and the Aviva Premiership is just fantastic. London Welsh have signed scrum-half Piri Weepu, who won the World Cup with New Zealand in 2011. "It's an honour to be part of the best club league in the world. The gap [with the Pro12] is widening to be honest." It has been a busy summer for Burnell with London Welsh signing 25 players and releasing the same number. Perhaps the most notable addition has been Rugby World Cup winner Piri Weepu from Auckland Blues. The 30-year-old Weepu has been capped 71 times by New Zealand and started the 2011 World Cup final against France, which the All Blacks won 8-7. The Exiles have developed a gnarly reputation and Burnell says that will not change despite the marquee signings. 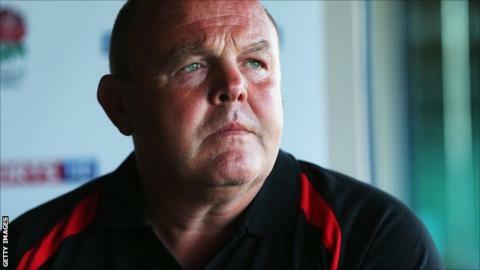 "It's a lot of hard work, but that's the good thing about London Welsh," he said. "It's all about that attitude and hard work and they've certainly got an abundance of those two really strong qualities." London Welsh were relegated from the top-flight of English rugby in 2013 after winning just five games, but club president John Dawes believes Burnell has reinvigorated the squad. "Justin has rebuilt the spirit at London Welsh and he seems to have the players working for him," said the former Wales and British and Irish Lions captain. "They can look forward with a degree of optimism. "We need a little bit of luck for the first few months, to avoid injuries and to get some results." Former Welsh centre Sonny Parker, now team manager at Kassam Stadium, says Burnell's approach will stand London Welsh in good stead. "Justin has this thing that there are no excuses in the squad," said the 36-year-old. "He's got that mentality and the boys are ready. We're expecting to win games."